Biological Source It is same as stated under Section 2.3.1 on pilocarpine. 1. It is a hygroscopic oily liquid or prisms. 2. It has the following physical parameters: bp10 261°C; [α]18D +50 C° (C = 2); pK1 (18°C) 7.17. 3. It is miscible with water and alcohol; very soluble in chloroform; less soluble in ether and benzene; and almost insoluble in petroleum-ether. 1. Isopilocarpine hydrochloride hemihydrate (C11H16N2O2 . HCl.½H2O): It is obtained as scales from ethanol having mp 127°C; when anhydrous mp 161°C; [α]D18 +39o (C = 5). It is soluble 0.27 part water and 2.1 parts ethanol. 2. 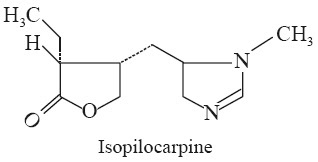 Isopilocarpine nitrate (C11H16N2O.HNO3): It occurs as prisms from water, scales from ethanol, having mp 159°C; [α]D18 +39o C (C = 2). It is soluble in 8.4 parts of water and in 350 parts of absolute ethanol. 2. It is also employed as miotic.